What is Cascading Style Sheets ? what is CSS ? which is a current version of Cascading Style Sheets you are using? define different types of Cascading Style Sheets? Cascading Style Sheets (CSS) mainly used for styling purpose or to beautify HTML Pages. Most of the people were using Cascading Style Sheets2 Or CSS2 version but right now in 2015 2016 new version of CSS is CSS3 which gives us lots of new features to beautify HTML Pages. Inline is define using tag level CSS. it is limited to that tag only to which it is define but is is very powerful and having high Priority .lets take example how to define Inline Cascading Style to a paragraph. here in above example i have defined tag where inline style is define using style tag where using double quote i am going to define look of my Paragraph . Problem with inline css is if you want to define same style to multiple paragraph you have to write style for each and every paragraph it will increase your work which is not feasible and next time if you want to change something it will be headache for you. If you Define Number of tag every paragraph on single page will take same style. you can also define selector using Class Name or Using id as show following Example Define css using Class Name. to apply define class to particular tag i have use < p class="main_txt"> Class attribute of that tag as shown in example. you can also define selector using ID as show following Example Define css using Class Name. to apply define class to particular tag i have use < p id="main_txt"> id attribute of that tag as shown in example. Problem with the internal CSS is again same if your Project contain 10 pages then you have to use 10 internal css for each page separately that is again not maintainable if there are any change then headache. External CSS Define Project Level CSS. Define One CSS Page and use Multiple times in number of pages in your as shown in following example . HTML long form is Hypertext Markup Language. it is known as language of Browser. 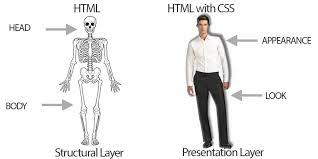 Mainly HTML is used to Define Structure of webpages or Called as Structural Layer . 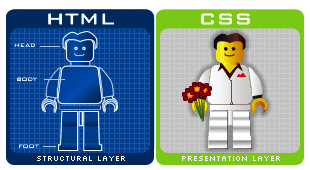 CSS used to Beautify HTML webpage or Also called Presentation Layer .